My Western/sci-fi novella Six Guns of Madness includes elements of steampunk, a genre I've wanted to write for a long time. The best definition of steampunk I've seen is "what if the future happened earlier?" Steampunk imagines an alternate history where modern or even futuristic technology is created with the primitive machines of the time, usually powered by steam. It also includes elements of pulp action adventure. Here are eight of the best in the genre. Fair warning, I don't care for novels that mix fantasy with steampunk like The Anubis Gates or Morlock Night, so they're not included. 8. Boneshaker by Cherie Priest - It's the 1800's, and Seattle is a walled-off ghost town, flooded with a mysterious gas that turns people into mindless killers. The wife of the scientist who caused the disaster has to go back inside to rescue her son. Priest broke tradition by setting her novel in the U.S. instead of Victorian London, and by adding zombies. 7. 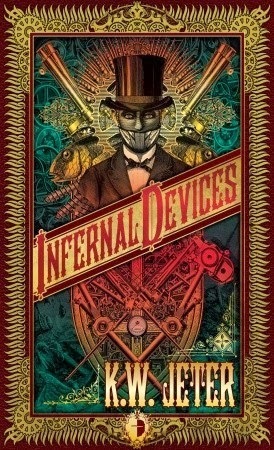 Infernal Devices by K.W. Jeter - Jeter is unique in that he not only wrote some of the earliest steampunk novels, but he himself invented the term. This novel involves a man drawn into a mystery involving his father, myriad conspiracies, and the construction of clockwork robots. It's primarily a comedy with references to everything from time travel to alternate realities. 6. Leviathan by Scott Westerfield - This Young Adult novel is set in an alternate version of World War I where the battle is fought between steam-powered war machines and genetically engineered creatures. The son of Archduke Ferdinand and a woman who wants to be an airman both end up aboard the Leviathan, a modified flying whale with a loyal crew. 5. The Time Machine by H.G. Wells - One of the first novels to approach the concept of time travel, Wells tells the story of a man who invents a time machine that sends him into the distant future. He ends up in a world that seems like Utopia, until he discovers the terrible secret behind Mankind's blissful existence. A sweeping epic that tackles class warfare in its most extreme form. 4. Warlord of the Air by Michael Moorcock - When Osward Bastable gets lost in a Himalayan temple, he finds himself in a future world of zeppelins and steampowered cars. This novel is unique in that it jumps through time from the 1900's to a steampunk 1970's. It was also written before the steampunk genre ever had a name. 3. The League of Extraordinary Gentlemen by Alan Moore - In Victorian London, Harkness assembles a team consisting of Dr. Jekyll, the Invisible Man, Captain Nemo, and Alan Quartermain to battle the evil Asian Doctor ( an unnamed Fu Manchu). Moore's outrageous mash-up of Victorian era literary characters as superheroes brought steampunk to a whole new level. Just don't watch the movie. Just...don't. 2. 20,000 Leagues Under the Sea by Jules Verne - One of the earliest examples of steampunk, this classic novel is also a marvel of futurism. Verne conceived of the submarine decades before it came into existence, and tells the story of a crew sent to investigate lost ships that finds an undersea pirate named Captain Nemo. Even today, the novel captures a sense of wonder for exploring the still unknown ocean's depths. 1. The Difference Engine by William Gibson and Bruce Sterling - After writing the novel that led readers to coin the phrase "cyberpunk," Gibson went the opposite direction to co-write a novel in steampunk. Gibson and Sterling's novel is set in an alternate 1800's where the mechanical computer has brought the digital age earlier. He weaves a story of conspiracy for a mysterious program, and tosses in historical figures like Ada Lovelace. It reads more like a historical mystery than the wild adventure of other steampunk outings.